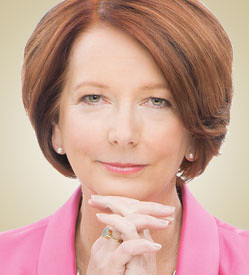 Julia Gillard, the 27th Prime Minister of Australia, is the first woman to serve in that role. Gillard was sworn in as the 27th Prime Minister of Australia in 2010 and served until 2013. Her nation- changing policies put her on Forbes list of the “World’s Most Powerful Women” in 2012 and 2013. As Prime Minister and in her previous role as Deputy Prime Minister, Gillard was central to the successful management of Australia’s economy during the Global Financial Crisis and as Australia positioned itself to seize the benefits of Asia’s rise. Gillard delivered nation-changing policies including reforming Australian education at every level from early childhood to university, creating an emissions trading scheme, improving the provision and sustainability of health care, aged care and dental care, commencing the nation’s first ever national scheme to care for people with disabilities and restructuring the telecommunications sector as well as building a national broadband network. In foreign policy, Gillard strengthened Australia’s alliance with the United States, secured stronger architecture for the relationship with China, upgraded Australia’s ties with India, and deepened ties with Japan, Indonesia and South Korea. Gillard has represented Australia at the G20, including winning Australia’s right to host the 2014 meeting, the East Asia Summit, APEC, and NATO-ISAF. Under Julia Gillard’s leadership, Australia was elected to the United Nations Security Council. In October 2012, Gillard received worldwide attention for her speech in Parliament on the treatment of women in professional and public life. Today her focus is worldwide education advancement. In 2014, Gillard was appointed Chair of the Board of Directors of the Global Partnership for Education. The following year she was appointed a Commissioner at the International Commission for Global Education Opportunity and in 2016 she became Patron at CAMFED, the Campaign for Female Education. She is also a Distinguished Fellow at the Brookings Institution. In recognition of her remarkable achievements and public service, Gillard was awarded a Companion in the Order of Australia in January 2017.